If you’re a gold investor, I’ve got some good news for you. Gold is gearing up for another big bull run. This is something that we’ve been predicting for a while, and it’s rewarding to see it finally coming to fruition. Indeed, after peaking at $1,345 per ounce early in 2018, gold hit the skids and slumped back down, only to charge back at the end of the year. Some investors lost faith, but we never did. We predicted that gold would stay above $1,300 per ounce in our 2018 gold forecast. So now what should investors expect for 2019 gold prices? More gains, to put it simply. As you undoubtedly know, gold performs best in times of uncertainty. Well, the world is fracturing both socially and politically. Dissatisfaction and anger have translated into major political shifts, like Brexit and the 2016 and 2018 U.S. elections. We’re now seeing more protests and more riots — not just in the U.S. but also worldwide. We've seen the longest government shutdown in U.S. history. The economy is cooling and a majority of economists see a large slowdown, if not a recession, in the next several years. Bad actors like North Korea and Russia have gotten more brazen. China has gotten more aggressive. The U.S. is no longer seen as the world’s most powerful and influential nation. And the odds of a large-scale war are at their highest levels in decades. No doubt, the world is becoming increasingly chaotic. Long-held rules and norms are being questioned, tested, and violated on a daily basis. And it will only continue getting worse. And as the world’s ultimate safe haven, gold will continue benefiting from this shift. Gold will always benefit from global turbulence, but it’s most affected by U.S. policy. After all, gold’s price is largely influenced by the value of the U.S. dollar. And the U.S. dollar is losing its value. It’s down about 10% from its peak, even after a 2018 rally that has already started to reverse. And there are a few reasons for this decline. One is that foreign currencies are getting more competitive. This is especially true of the euro, which is the U.S. dollar’s chief rival. After taking interest rates negative in some cases, Europe is finally trying to rein in its monetary stimulus. Plus, the Chinese yuan is increasingly used to settle international transactions. Also diminishing the U.S. dollar is a dysfunctional U.S. government. A unified Republican government failed to achieve any significant policy victories in the first two years of Donald Trump's presidency. Instead, it was consumed by infighting and undermined by a president who spends more time tweeting than he does leading. After promising for seven years to repeal Obamacare, the Republican effort flamed out in multiple high-profile failures. This undermined confidence both on Wall Street and Main Street. Congress also failed to pass a budget and instead continued fighting over spending and the debt limit. This is hurting the U.S. dollar more than anything else Congress has done (or failed to do). Then there are massive deficits from a tax cut that wasn't offset by spending decreases. Indeed, more gridlock and upheaval is on the docket for 2019 — not less. When we talk about U.S. policy in regard to gold, we must also discuss the Federal Reserve. 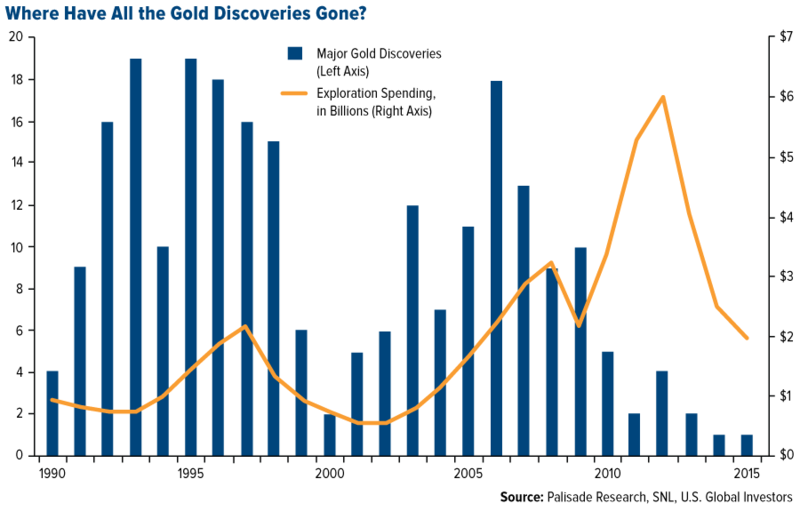 There’s no question that gold has been largely constrained by Fed policy. But the notion that rising rates will crush gold is completely unfounded. For one thing, the Fed is raising interest, and yet, the U.S. dollar is down and gold is going up. This alone should dispel any notion that monetary tightening is a death knell for gold. But what’s more is, if you look at history, this trend isn’t uncommon. Historically speaking, the U.S. dollar actually underperforms in most periods of monetary tightening. Look at the last two monetary tightening periods — in February 1994 and in June 2004 — and you’ll see nearly identical patterns. In both cases, the U.S. dollar strengthened before the first rate hike but then weakened by around 8% over the next six months. The U.S. dollar index then remained consistently below its level on the day of the first rate hike for the next two to three years. You’ll also note that, in those instances, gold prices went higher. Gold more than doubled between 2004 to 2008, shooting from $400 per ounce to nearly $1,000 per ounce. What all this data and historical precedent says, basically, is that the market tends to overestimate the effect monetary tightening has on the U.S. dollar and, thus, on gold. And that’s what we’re seeing now. At this pace, interest rates won’t hit be hitting 4% until 2023. Gold is outperforming because the market has underestimated it. It was oversold based on Fed policy and is now correcting. Here’s the simple reality: There’s only so much gold in the world, and we’ve already mined most of it. The world’s most productive mines have been fully depleted. South African gold production, for example, has fallen from over 1,000 tons in the early 1970s to around 160 tons today. There isn't currently a single South African gold mine among the world’s top 20 gold producers when, in years past, they dominated the sphere. And it will only continue getting worse from here on out. Mine supply will fall by roughly a third over the next decade. All the aforementioned factors — political instability and global monetary policy — will affect gold in the short term. But peak gold is the key catalyst that will be driving gold prices higher and higher over the next five, 10, 20 years, and beyond. And this is why we’re so bullish on the metal, even when it falls out of favor. We're firmly expecting gold to carry its 2017 momentum into 2019, topping $1,400 per ounce and maybe even making a push toward $1,500. 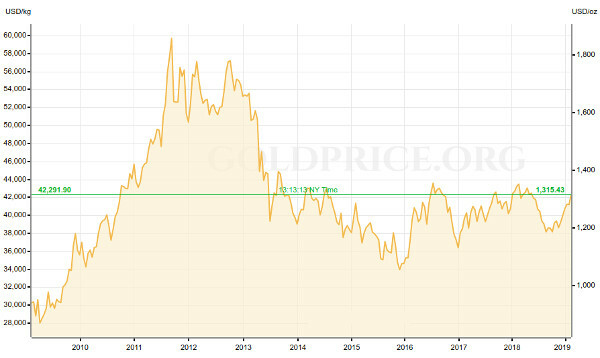 How far gold goes in the short term will depend on the amount of political instability we see. But again, gold’s long-term future is bright.